In 2018, the notion of "inferior potential parenthood" still undergirds US family and child welfare law, serving as the justification for 33 state laws that allow for the severing of the constitutionally-protected parent-child relationship because of a parent's status as disabled. Parents with disabilities are suffering under these laws, as are their children. For years, in a variety of ways, several UC Berkeley faculty members directly affiliated or otherwise associated with the Haas Institute Disability Studies research cluster have done research on subjects related to this issue. This policy brief will provide an overview of current legislation that discriminates against parents with disabilities. It will also consider non-discriminatory legislation that has been enacted or is currently being enacted at the state level, with the hope of encouraging more states—eventually all states—to adopt similar legislation. 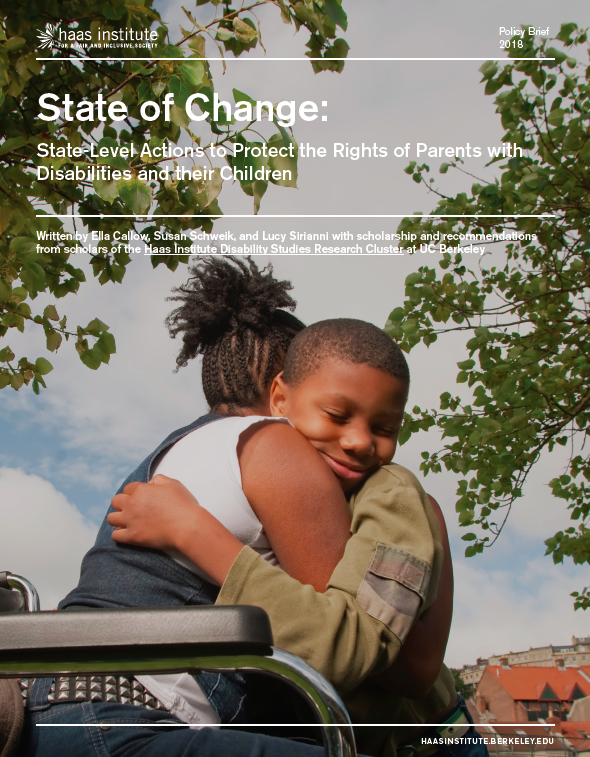 It is our strong belief that such legislative changes are both needed and deserved by the at least 4.1 million disabled parents currently raising children under the age of 18 in the US as well as by the roughly 6.1 million children who rely on them for care.